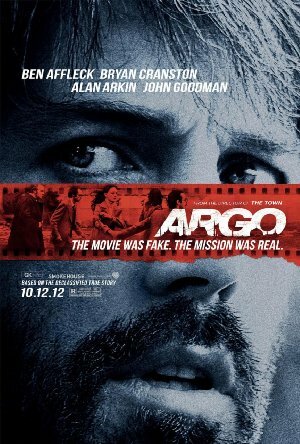 Argo builds on Ben Affleck’s most recent films to continue to cement his reputation as a director of high quality movies. The actual story and the film center around the history of the U.S. involvement in Iran prior to the Iranian Revolution of 1979. Decades earlier, the U.S. had installed the Shah, Reza Palavi, into power and he was a cruel ruler given to enormous excess in his personal lifestyle. The Savak, his secret police, routinely made people disappear and murder/torture was commonplace while the Shah continued his life of opulence. The film describes this at the open. Then the Shah was given refuge in the U.S. as the revolution swept through the nation of Iran, installing the Ayatollah Khomeini in power. On November 4th, 1979 the demand for the Shah to be returned for trial and execution reached a new height and supposedly “students” seized the U.S. Embassy, taking hostages. Six employees in the visa division managed to sneaked out in the chaos and eventually took refuge in the home of the Canadian ambassador. Word of their escape made its way back to the U.S. State Department and the CIA. Plans began to be discussed to get them out of the country, as if they were to be captured, they would undoubtedly be executed. The State Department has the lead on the project, but asks the CIA to help as they are the experts as so-called “ex-fils” (it’s the insiders way of shortening the phrase exfiltration) and their best expert is Tony Mendez (Affleck). There are no suitable ideas at the first meeting and he goes home that night and calls his son. Mendez and his wife are on a “break”. The son is watching a movie that Affleck switches on and the idea is born. An idea he presents to his boss “Jack O’Donnell” (Bryan Cranston) the next day. The six will be working with Mendez as a Canadian film crew. He will set up a cover story in Hollywood to back up their claims and walk them right up to the departure gate at the airport in Tehran and just fly right out of there. It’s not the best idea but there are no options for best ideas and his plan quickly gains support. Including that of his long-time friend John Chambers, a famous Hollywood make-up artist who’d won a special Academy Award for his artistry. They find a producer, “Lester Siegel” (Alan Arkin) and quickly they have a production company and a movie in pre-production. Titled “Argo” it’s a Star Wars/Planet of the Apes rip-off that requires desert scenery, making Iran the perfect place to shoot it. Approval comes and Mendez is off to Iran to put the plan to good use. Security at the airport has been increased several times as members of the Shah’s former staff have tried and failed to sneak out of the country. The six themselves don’t think the plan will work. But their lives depend on it working and time is running out. The Canadian Ambassador, “Ken Taylor” (Victor Garber) has been ordered to close the embassy and come home. This is superior moviemaking. The story captures the attention of the viewer through the use of both footage from the actual events involved and detailed re-creations. Someone really did their homework in getting the little things right. The kind of things you only notice when they’re done wrong. The best available typewriters were programmable correcting IBM Selectrics and there’s one on the desk of the secretary to the Secretary of State. The cars are right, the clothing, appearance and mannerisms. Perhaps only those of us who lived through the era as young adults will remember and recognize it so vividly, but the filmmakers did this very well. They also did everything else well. Music. Story. Making an edge-of-your-seat spy thriller without “shaken, not stirred” martinis and elaborate gunplay is difficult, but Affleck and his crew pulled it off. Arkin and Goodman provide just the right of comic relief without going overboard. Affleck delivers a very fine performance, as does Cranston. Behind the lens, Affleck also delivers, keeping the film tight and filled with tension right through the third act of the film, leaving viewers wondering how it will end even if you already know the outcome. It is an ending that is definitely worthy of seeing on a big screen to get the full effect. Ben Affleck playing the role of Tony Mendez, a real person who is of Hispanic ancestry, has received criticism as an example of Hollywood’s racism. Tail Slate‘s And Palladino wrote an interesting and thought-provoking article about this subject. After having seen the film myself, I disagree with my colleague’s conclusion that the film should be rated only a 1. While I agree that this can be seen as an instance of racism in Hollywood, I can’t agree with his contention that the film automatically deserves a rating of 1 for this reason alone. Casting Ben Affleck as Tony Mendez in Argo isn’t the same as someone having tried to cast Dustin Hoffman as Jaime Escalante in Stand and Deliver. The ethnicity of the central character in that film is far more ingrained into film’s story than the actual ethnicity of Tony Mendez in Argo. Ultimately, this is a tempest in a teapot. Making a movie and choosing the actors to portray the roles is first and foremost about casting actors who will put “butts in seats” and make the film profitable. If producers take a character whose race in ingrained in the psyche of the audience, then casting someone not of that race may be a very bad decision and cost them money. Acting is a craft and not always about the race of the actor.